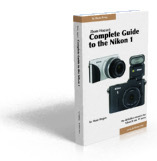 I'm pleased to announce that my Complete Guide to the Nikon 1 is now finished and available for purchase. You'll note a new Books item on the menu bar, above, from which you can access this and any future books that might apply to mirrorless cameras as I create them. The Complete Guide to the Nikon 1 is a 500+ page book that goes through everything there is to know about the Nikon J1 and V1 models, including some previously unreported things like where the 73 phase detect autofocus sensors are. It takes me almost 20 pages to cover the focus system and all of its options, and why you might want to use certain settings over others. I include complete DOF charts for the 10-30mm lens, tips on the most interesting AF-S lenses to use on the FT1 lens adapter, and even point out some very strange things about still image sizes when taken while shooting video. And yes, I cover the video side of the camera, too. It's all there, that's why I call them "Complete Guides". Available now for US$19.99 for the downloadable PDF, which should work fine on Kindle, Nook, and iPad (Goodreader app recommended) as well as Acrobat Readers on Macs, PCs, and Linux systems. Those of you who want a paperback version of the book will have to wait late April for it to be available. If you're thinking about getting a Nikon 1, you'll want to read this book both before and after you get the camera.